I had my first Aerial Yoga class today at The Circle Brighton with Maxine. It was lovely to be weightless in variations of traditional asana, inverted and floating in the air. The soundtrack was fabulous, with artists such as Morcheeba, perfect for the floating, mellow mood, even though it was also a challenge and strengthening. It was great to see the world from a different perspective, upside down! It felt very graceful, encompassing feminine energy. There were soft, green slings hanging from fixtures in the ceiling. We started with some stretching/warming up asana using the slings. The instructor gently led us into some lovely inversions such as inverted Badhha Konasana and Sarvangasana. This style of yoga keeps you very in the present moment, as you need to concentrate and be fully aware of your body. I have trained in Aerial Circus Hoop and Silks before, it was quite similar, I really enjoyed it. It was great to stretch out the back muscles and decompress the spine, perfect for someone who sits down or stands up all day for their job or has a tight, tense back. In traditional yoga you are always on the mat so it was great to be suspended in the air. I do a lot of yoga so it was refreshing to do something a little different, try a new challenge and get a deeper stretch. The instructor was very helpful and supportive. Most of the class was inverted which I really enjoyed. I loved the end Savasana where we cocooned ourselves from head to toe, gently swaying and being held by the sling. 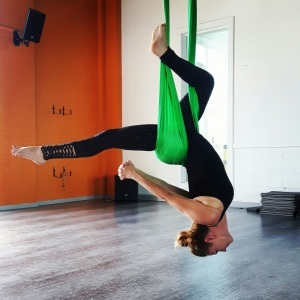 I felt very relaxed and open afterwards, I will definitely be doing Aerial Yoga again! Thanks Maxine.